China’s national glorification was accompanied by the suppression of human rights in Tibet and East Turkestan and the restriction of freedom of expression and press. On Sunday [24 August 2008] evening, Beijing concluded the 29th Olympiad that had opened 16 days ago with a ceremony that awed and mesmerized spectators and television viewers around the world. Under the spotlight of the international media, the Chinese government presented exalted images of China's history and culture. "The Chinese authorities have blatantly and successfully used the Games to achieve political goals—putting the international community on notice that China is a powerful gold-medal state and stoking patriotism and national pride among countless Chinese. Yet the carefully orchestrated facade could not conceal a police state that tramples on human rights," said Human Rights in China Executive Director Sharon Hom. Well past the closing ceremony, long after all the foreign guests have left, it is the Chinese people who will continue to shoulder the enormous financial, environmental, and social costs of hosting the Games. On August 8 , spectators saw a show of a unified and proud nation. But soon afterward came the revelations that the powerful images projected were not the whole story: the televised fireworks display was digitally enhanced; the 9-year-old girl who sang the "Ode to the Motherland" was made to lip synch a more perfect voice of the little girl deemed not cute enough to serve the national interest; and all of the children in the parade meant to celebrate China's 56 ethnic minority groups were in fact Han, the dominant ethnicity of China. The message is clear: this is just a show, the truth does not matter. When making its bid to host the 2008 Olympic Games, the Chinese authorities pledged to the International Olympic Committee (IOC), the international community, and the Chinese people that hosting the Games would promote not just the development of Beijing, but the development of society, including democracy and human rights. In the end, the government did not only fail to live up to its promise to improve the human rights situation in China, it worsened it, in the name of beautifying Beijing and providing security. Since 2001, an estimated 1.5 million people have been forced out of their homes to make way for Olympics venue construction, with little or no compensation for their losses. In the same effort to cleanse perceived unsightliness from Beijing, one million migrant workers used for construction were asked to leave the city before the Olympics began. Even the prison population suffered: He Depu, an inmate of Beijing's No. 2 Prison, recently revealed that, in 2007, as a result of remodeling the roof of the prison to welcome the Olympics, prisoners there were not even allowed to go outside for fresh air for six months. Throughout the preparations and the staging of the Games, the IOC kept its head in the sand when faced with reports of violations of media access, crackdowns and round-ups, and concerns about air pollution hazards. 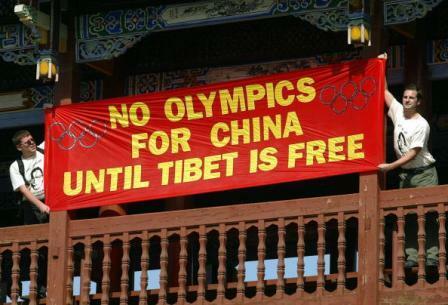 While insisting on the apolitical nature of the event, the IOC enabled the Chinese government to ignore its Olympics promises and exploit the Olympics as a political tool to achieve nationalistic goals at the expense of its people. In the final months leading up to the Games' opening, Human Rights in China reported on scores of individuals who were harassed, monitored, detained, or forced to leave town by security forces, all in the name of ensuring a "peaceful" Olympics. Those outside the capitol deemed politically sensitive were put under tight surveillance and explicitly prohibited from going to Beijing. During the Games, the Chinese authorities continued their crackdowns on activists, petitioners, bloggers, concerned citizens, and lawyers—apparently undeterred by the international spotlight focused on Beijing and China. Largely outside of international scrutiny, the Chinese authorities continued their crackdowns in Tibet and Xinjiang [also known as East Turkestan]. After designating three public parks in Beijing for protests and demonstrations, the government granted not one of the 77 applications to stage protest. Two elderly applicants have been sentenced to Reeducation-Through-Labor. Even foreign journalists seeking to report on human rights, ethnic tensions, or social unrest were subjected to intimidation and crude police tactics, and in a few cases harassed, detained, or even beaten for simply trying to report the news. Finally, the vast collection of bio-metric data gathered on the hundreds of thousands of foreign tourists, journalists, and government officials should have, but did not raise serious privacy and human rights alarms regarding the appropriate storage and use of this data. Yet it will be Chinese citizens who will be the main targets of this enhanced surveillance and security system—China's new "Police State 2.0." Part of the evidence cited in the decision sentencing the two elderly petitioners to Reeducation-Through-Labor, for example, was video evidence. The total costs of staging a show of national glorification will be borne by the ordinary people in China, a fact perhaps not immediately apparent to the foreign visitors who marveled at the splendid new architecture on the temporarily cleaned-up streets of Beijing. The Chinese government spent close to $43 billion to host the Beijing Olympics, the most expensive Games ever in Olympic history. That is almost one-third of the projected $146 billion needed to rebuild the areas devastated by the earthquake in Sichuan. The serious air pollution and water shortage crisis in China was both temporarily addressed and worsened by hosting the Games. Although Chinese authorities and the IOC insisted that the air quality posed no problems for the athletes, it is Chinese citizens who will bear the health costs for the ongoing impact of environmental pollution, especially after temporary Olympics air pollution measures are lifted. The Beijing Olympics also consumed an estimated 200 million cubic meters of water—the equivalent of the annual water supply for one million people—all diverted from Hebei, a nearby province facing a severe drought over the past several years.